British Columbian athletes were in full force at the Canadian Youth Championships in Winnipeg, MB this past week as Emma Boyd and Auzzie Chambers would make a trip to the Gold Medal Matches in the Junior Championships. The week would start with the Juniors, where BC had 3 Girls and 3 Boys that would start the week off with Round Robin play and also breaking out to the Foster-Lang Pairs event. Emma Boyd would be the class of the field by far at this tournament, as she would make it through the Round Robin unmarked and go undefeated. Moving on to the to the semi-finals where she breezed her way into the Gold Medal Match with a convincing 18-4 Win over Cori Millard from ON. In Junior action the games are first to 18 points. 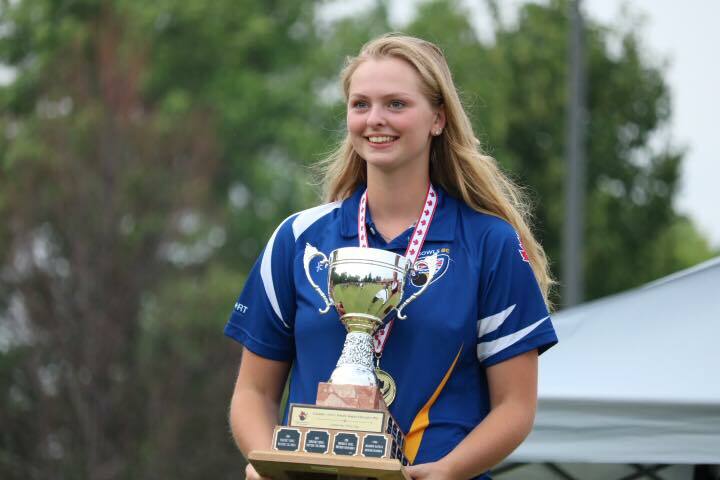 In the other Semi Final it was Baylee Van Steijn (ON) that would beat Amy Spence (PEI) 18-11 setting up the final match between the two opponents from rival Provinces. In a tight game most of the way through it was BC’s own Emma Boyd that would get over the line to take home the Canadian Title as she would win 18-12. This was Emma’s final year of eligibility in the Juniors so it was great to see her achieve her goal of becoming the Canadian Junior Champ. The Bronze Medal would go to Millard as she would beat Spence 18-8. The Junior Boys would see Auzzie Chambers make his way through the Round Robin only dropping one game to Ontario’s Eric Galipeau, but would hold his ground and make it to the semi-finals where he would eventually beat Nova Scotia bowler Liam Campbell 18-17 putting him in the Gold Medal Match where he would have Galipeau waiting for him once again. In a tough Match Chambers would eventually lose the final 18-8 and take home the Silver Medal. Jake Masterson would win the Bronze Medal over Liam Campbell in a game that finished 18-10. Congratulations to Emma on her Championship victory and Auzzie for winning the Silver Medal. Also to all the competitors as we are all really proud of everyone one of you, as you represented our Province amazingly well, both on and off the greens.